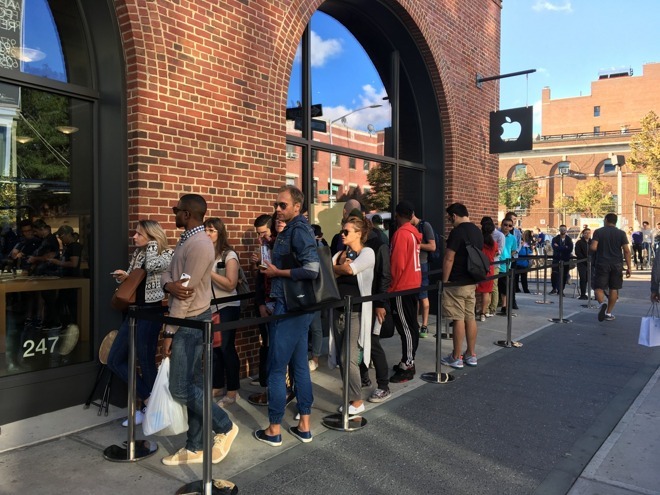 Financial analyst firm Piper Jaffray polled 83 people waiting in line for an iPhone 7. The company found that 54% of launch buyers were looking at buying an iPhone 7, with the remaining 46% set on buying the iPhone 7 plus, what the firm calls "essentially the inverse" of launch traffic for the iPhone 6 and 6s. According to the firm, more buyers were seeking the 128 GB capacity than the 256 GB model, which may have been affected by the larger phone not being available at retail. The analyst firm assumes that the larger Plus-sizes of the iPhone also will attract customers seeking higher storage capacities, as it has in the past. Additionally, 98% of the buyers in line already owned an iPhone, with only 2% being switchers from Android. Between the small sample size, and prevalence of launch day purchasers being upgraders from older iPhones, little weight was attributed to the switcher percentages by the firm. Previous launches differed somewhat as far as switcher numbers. For the iPhone 6s launch, 88% of buyers were loyalists to Apple. 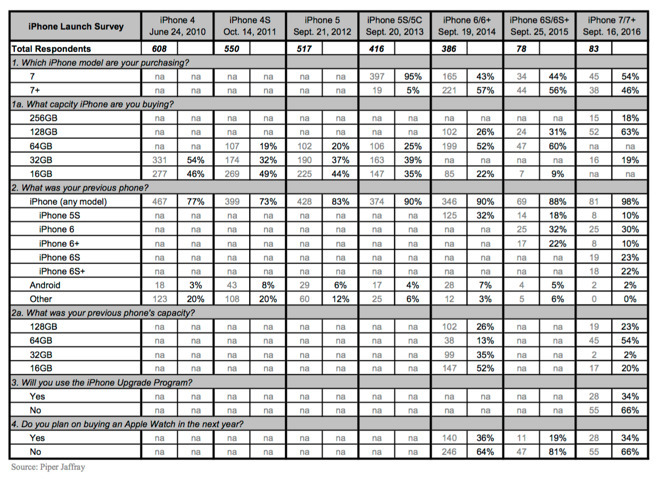 Notably, the iPhone 6s launch population sample size was lower than the current group. Despite difficulties in pre-ordering phones on the iPhone Upgrade Program on launch day, 34% of the respondents were planning on using the program to finance the day's purchase. Piper Jaffray believes that approximately 25% of iPhone sales in the US are made at Apple retail locations, with about 9% of the total being sold through the upgrade program. Piper Jaffray believes that the polling size decrease over the peak of 608 hit with the iPhone 4 has little to do with demand, and more to do with the vast array of pre-ordering options now available to customers.